A man is running. Fits probably more to the vocabulary of sport. Otherwise, a boring picture at a time when everyone is running anyway. But running can mean many things. Running away from something or anyone. Step up the pace, give gas. Or move forward at the highest level, never settle down, think extremely, act extremely, live extremely. Therefore, running is also a metaphor for our entire existence: As long as our hearts are running, we run too. Standstill inevitably means the end. It's quite possible that the Cowboys From Hell think that way. 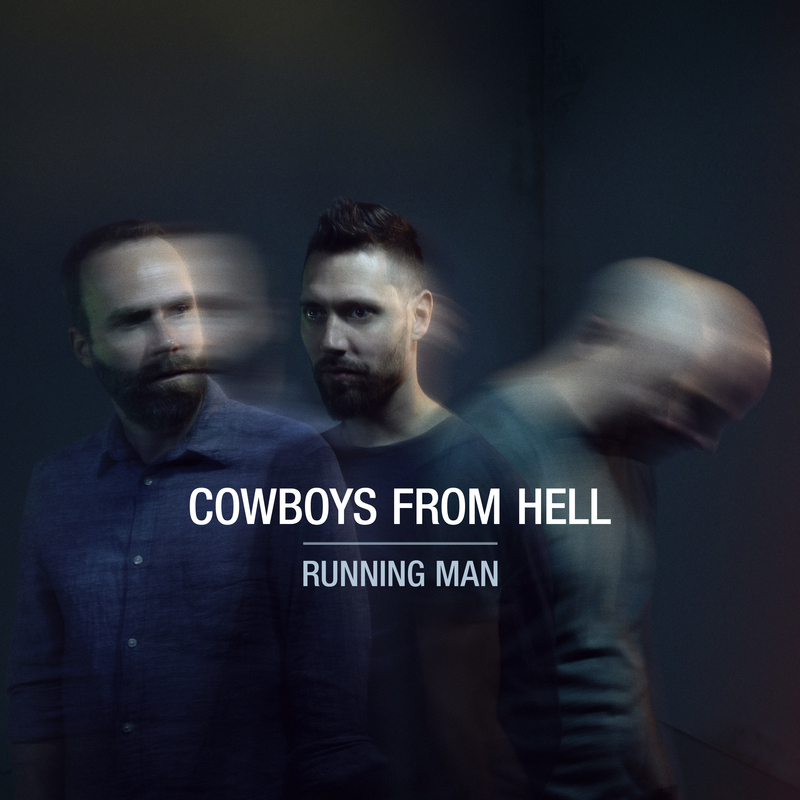 Following "Monster Rodeo" (Altri Suoni) in 2008 and "Big Fish" (DMCHR 71107) in 2012, they call their third album "Running Man” not without reason. At first glance, this sounds like the logical continuation of their once brutal sound avalanches, for which there are so many drastic comparisons in the media as "music that is always able to scare your grandmother, but also tells stories that are worth being told. "(Jazzthetik),” Music for the pit of yous stomach” (Tagesanzeiger, Switzerland), "Wicked. Exacerbated. Borderline"(Sonntagszeitung, Switzerland). But somehow body-hurting noise, booming ears, throbbing skull membranes and vibrating walls no longer seem to be the sole bliss-making goal of the high-speed cowboys. "We did not want to be as blatant as we used to be," saxophonist Christoph Irniger described the surprisingly multi-faceted development process of the trio documented in nine songs. If he, bassist Marco Blöchlinger and drummer Chrigel Bosshard did it the hard way in the past, then that meant: "Wild at any price, complicated and full of biting humor. Of course, these are all things that still have a certain value for us. But in the meantime, we do not have to show that we can play really difficult stuff, like 11/8 or 7/4 bars. In the meantime, we want one thing above all: finally to be authentic." A maturing process of the three men without a doubt who have either reached the limit of the thirties in 2018 (Irniger) or have arrived in the early forties (Blöchlinger and Bosshard). Since 2005, they have been riding around Swiss and European countries as hard to overhear, tough wild west musicians, playing in very different areas of the music scene. For example, Chrigel Bosshard and Marco Blöchlinger are regarded as the mainstays in pop bands such as Lunik, Marc Sway, Steffe La Cheffe and Myron, while Christoph Irniger enriches jazz clubs and festivals with his trio and the group Pilgrim. A constant, restless back and forth between the genres, between styles and melodies, quotes and influences. "Of course, everyone has his personal favorites," Irniger explained the energetic hodge-podge. "I just recently practiced 'Off Minor' by Monk for an hour. That's the good old jazz. My contribution to the Cowboys. The other two have also enjoyed a solid jazz education, but are clearly rooted in pop and rock. " Not the least because of that, the three Zurich residents are once again taking a real risk. They break with conventions and stereotypes, underlining exactly what not so long ago subdivided music into good and bad, valuable and superficial, exciting and routine, free and regulated, but this time much more subtly, finely, and sustainably. They act without blinkers, and do not spend much time reflecting on whether steaming funk grooves, smoking rock cannons or bubbling electronics fit into an improvising corset. They simply try it, with sometimes quite amazing results reminiscent of Frank Zappa or Rage Against The Machine for their dynamic shades of film music. Of course, the three Cowboys from Hell are still loud and wild. That's their blood. But now it is no longer about a racket as a distinctive feature. Instead, the common playing attitude is in the current center of the collective desires. "We have become more compact,” the saxophonist summed up. A controlled eruption that includes pieces like "Breaking Stones", "First Song", "Speed Of Sound", "Wicked Game", "Urbi Et Orbit", "The Slope", "I'll Be Fine", "Vintage Baby" or the title song clearing the path from the volcano down into the valley. When everything has come to rest, when the lava has cooled, then suddenly there is a piece of hitherto unknown, fascinating music in the wide landscape. An adrenalin-containing pleasure. "... Quite independent boundaries between rock, jazz and ambient electronics, or a dense mixture of these, can be listened to on "Running Man", a modern, perfectly produced and played instrumental prog with avant-tendencies, which over the long playing time of the album may have turned out a bit too uniform, but nevertheless entertains very well and captivates the listener. But if you expect (only) a solid Jazzcore, you might be disappointed by the album." "... All in all a successful mixture, carried by brute energy and unbridled joy of playing."